Morgan Lucas in Top Fuel and Hector Arana in Pro Stock Motorcycle qualified No. 1 in their fields at the 28th annual Lucas Oil NHRA Nationals. They were joined atop the packs by Mike Neff in Funny Car and Mike Edwards in Pro Stock. On-again, off-again rain – including a three-hour delay in the middle of the day – created a stop and go kind of day that eventually stopped when more wet weather returned late in the day to Brainerd International Raceway in Minnesota and halted action near the end of the final Pro Stock Motorcycle session. The Top Fuel, Funny Car, and Pro Stock fields were set based on the three previous qualifying sessions. The No. 1 spot for Lucas is his second of the year following his pole position in St. Louis with the GEICO Powersports entry. Lucas powered his Jimmy Walsh-tuned rail to the top of the sheets Saturday morning with a stout 3.868 to lead the field by nearly two-hundredths of a second. “The conditions are what’s going to determine tomorrow,” said Lucas. “But I’m really excited about how this weekend has gone so far. We started out yesterday and our whole game plan was just to go down the track in the first session. Last night we thought the track would probably hold a .94, and this morning we went up there and Jimmy said, ‘I can leave it pretty hopped up, or I can back it down and just try to go down the track, but let’s see what it can take.’ It went an .86 and I think it could have even used a little more in the middle of the racetrack. Larry Dixon, who rocketed to a 3.886 in the Alan Johnson-wrenched Al-Anabi dragster, and defending event champ Tony Schumacher, in his Mike Green-tuned U.S. Army racer, also got past Friday leader Cory McClenathan, whose Fram Tough Guard machine slid to fourth after he was unable to better his Friday 3.91. Doug Kalitta will have his season-best start after chalking up a 3.905 to place the Red Line Oil/Kalitta Motorsports entry fifth. Points leader Antron Brown is qualified sixth. Veteran Chris Karamesines holds down the final spot in the field and will be Lucas’ first challenge Sunday. Neff had the mixed fortune of being the last Funny Car in line for the third qualifying session and the only one who didn’t get a chance to run before heavy rains caused a three-hour delay. By the time crew chief John Medlen was able to bring the Drive One Mustang to the line, the air had cooled five degrees and the corrected altitude had improved by about 300 feet, and he was able to take advantage of that to push Neff to a 4.126 to bounce Ron Capps’ 4.169 from the top spot he’d occupied during the delay. Capps’ Ed McCulloch-tuned NAPA Auto Parts Dodge had grabbed the No. 1 spot from Ashley Force Hood, whose 4.178 had taken it from Friday leader Bob Tasca III earlier in the session. By the time things shook out at the end of a quick session, Cruz Pedregon (4.179) and John Force (4.195) also had gotten past Tasca, who slid to sixth despite an improved 4.200. Edwards now has qualified his A.R.T./Young Life Pontiac No. 1 in the Pro Stock field at exactly half of the season’s 16 races thus far and now turns his attention to improving his Sunday success and adding a fourth season win. Edwards had the quickest car in the every qualifying session, including the third and final, where he chalked up a 6.694, the only 6.6-second pass in the class. “We made another nice run today, but I think we could have been about a hundredth quicker if we had been just a little bit more aggressive,” he said. “We thought that we had gotten after it pretty good, but it wasn’t enough and the car moved around a bit on the first part of the run, which scrubs off some e.t. I’m just glad that we were able to hold off the rest of the other teams for the No. 1 spot, and I don’t know if we would have been able to do it if there had been a fourth session. As was the case Friday, Allen Johnson wasn’t far behind with his Mopar Dodge, holding onto the No. 2 spot with a 6.701. Six drivers in all bettered Edwards’ Friday-leading time of 6.732. Greg Anderson remained in the No. 3 spot after a 6.708 from his Summit Pontiac while teammate Jason Line, a second-round loser in Stock earlier in the day after qualifying No. 1 there Friday in a rare return to his roots, is No. 4 at 6.722. Ron Krisher in fifth in his Valvoline Cobalt at 6.724 and Vinnie Deceglie continues to impress with a 6.729 that has the Mountain View Dodge in the No. 6 spot. Rickie Jones’ 6.820 held down the final spot in the field; he’ll be Edwards’ first hurdle Sunday morning. Arana, who had held the Pro Stock Motorcycle lead early in Friday qualifying but lost the top spot based on speed, jumped back to the top of the field with his Lucas Oil Buell after riding to a 7.048 Saturday morning that pushed him back around Karen Stoffer, who could not improve on her 7.084 aboard her GEICO Suzuki. Arana and world champ Eddie Krawiec were the only two riders not to get a pass in the fourth session, and Krawiec had to settle for fourth. The pole position in Arana’s third in the last five races. “Today I feel great,” said Arana. “It couldn’t have gone any better. We made three awesome runs and I’m happy that the Lucas Oil bike is running awesome. Tomorrow, I feel great. I feel good about it. Krawiec’s Screamin’ Eagle/Harley Davidson teammate Andrew Hines sits in the third spot with a 7.102, seven-thousandths in front of Krawiec. Behind them are Shawn Gann with a season-best fifth ranking for his Rum Bum Buell, Michael Phillips, Steve Johnson, and rookie sensation Doug Horne. David Hope’s Vroom Racing Buell ended up in the 16th and final spot in the field with a 7.271, but well ahead of the four riders on the DNQ list. Hope will oppose low qualifier Arana in Sunday’s first round. First-round pairings for professional eliminations Sunday for the 28th annual Lucas Oil NHRA Nationals at Brainerd International Raceway, the 16th of 24 events in the NHRA Full Throttle Drag Racing Series. Pairings based on results in qualifying, which ended Saturday. DNQs listed below pairings. Top Fuel — 1. Morgan Lucas, 3.868 seconds, 307.16 mph vs. 16. Chris Karamesines, 6.367, 225.48; 2. Larry Dixon, 3.886, 304.60 vs. 15. Scott Palmer, 5.224, 217.39; 3. Tony Schumacher, 3.893, 308.71 vs. 14. David Grubnic, 4.157, 270.97; 4. Cory McClenathan, 3.899, 306.74 vs. 13. Tim Cullinan, 4.122, 286.62; 5. Doug Kalitta, 3.905, 311.27 vs. 12. Shawn Langdon, 4.101, 254.86; 6. Antron Brown, 3.947, 304.46 vs. 11. Terry Haddock, 4.035, 289.07; 7. Spencer Massey, 3.948, 303.23 vs. 10. Joe Hartley, 3.984, 306.19; 8. Brandon Bernstein, 3.965, 304.05 vs. 9. 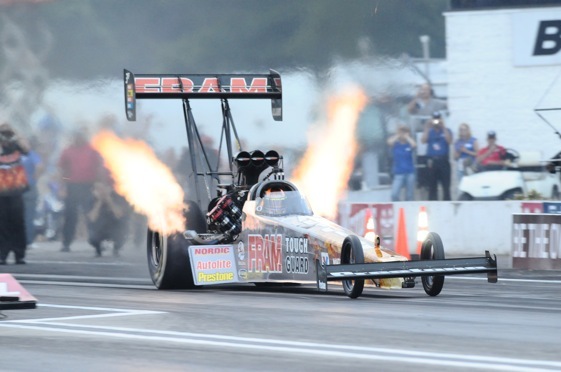 Clay Millican, 3.974, 302.62. Did Not Qualify: 17. Luigi Novelli, 7.127, 204.73. Funny Car — 1. Mike Neff, Ford Mustang, 4.126, 304.46 vs. 16. Jack Beckman, Dodge Charger, 4.351, 269.35; 2. Ron Capps, Charger, 4.169, 292.01 vs. 15. Tim Wilkerson, Mustang, 4.329, 279.21; 3. Ashley Force Hood, Mustang, 4.178, 292.77 vs. 14. Jack Wyatt, Dodge Stratus, 4.279, 280.49; 4. Cruz Pedregon, Toyota Solara, 4.179, 296.24 vs. 13. Matt Hagan, Charger, 4.266, 286.50; 5. Tony Pedregon, Chevy Impala, 4.188, 293.73 vs. 12. Jeff Arend, Solara, 4.248, 292.65; 6. John Force, Mustang, 4.195, 285.41 vs. 11. Bob Bode, Chevy Impala SS, 4.228, 278.69; 7. Bob Tasca III, Mustang, 4.200, 292.71 vs. 10. Jim Head, Solara, 4.213, 288.83; 8. Del Worsham, Solara, 4.206, 292.33 vs. 9. Jerry Toliver, Chevy Monte Carlo, 4.209, 296.50. Did Not Qualify: 17. Dale Creasy Jr., 4.398, 274.05; 18. Robert Hight, 6.636, 206.13; 19. Justin Schriefer, 9.984, 261.42. Pro Stock — 1. Mike Edwards, Pontiac GXP, 6.694, 205.35 vs. 16. Rickie Jones, Dodge Stratus, 6.820, 202.48; 2. Allen Johnson, Stratus, 6.701, 204.98 vs. 15. V. Gaines, Stratus, 6.785, 202.67; 3. Greg Anderson, GXP, 6.708, 204.91 vs. 14. Larry Morgan, Stratus, 6.769, 202.36; 4. Jason Line, GXP, 6.722, 204.91 vs. 13. Kurt Johnson, Chevy Cobalt, 6.764, 204.01; 5. Ron Krisher, Cobalt, 6.724, 204.91 vs. 12. Steve Spiess, Cobalt, 6.759, 202.91; 6. Vinnie Deceglie, Stratus, 6.729, 204.05 vs. 11. Jeg Coughlin, Cobalt, 6.752, 204.85; 7. Johnny Gray, Stratus, 6.733, 204.85 vs. 10. Warren Johnson, GXP, 6.749, 204.63; 8. Rodger Brogdon, GXP, 6.736, 203.98 vs. 9. Greg Stanfield, GXP, 6.748, 204.26. Did Not Qualify: 17. Bob Benza, 6.908, 200.71; 18. Dave River, 7.087, 194.21; 19. Mark Hogan, 7.558, 197.54. Pro Stock Motorcycle — 1. Hector Arana, Buell, 7.048, 187.52 vs. 16. Wesley Wells, Suzuki, 7.241, 184.98; 2. Karen Stoffer, Suzuki, 7.066, 187.57 vs. 15. Mike Berry, Buell, 7.226, 180.98; 3. Andrew Hines, Harley-Davidson, 7.090, 188.23 vs. 14. Junior Pippin, Buell, 7.208, 182.72; 4. Michael Phillips, Suzuki, 7.100, 189.68 vs. 13. Bailey Whitaker, Buell, 7.205, 180.38; 5. Eddie Krawiec, Harley-Davidson, 7.107, 188.28 vs. 12. Matt Smith, Suzuki, 7.185, 184.83; 6. Shawn Gann, Buell, 7.107, 186.12 vs. 11. Jim Underdahl, Suzuki, 7.159, 187.03; 7. Craig Treble, Suzuki, 7.137, 187.31 vs. 10. Matt Guidera, Buell, 7.158, 182.85; 8. Steve Johnson, Suzuki, 7.149, 185.69 vs. 9. Douglas Horne, Buell, 7.155, 187.65. Did Not Qualify: 17. Redell Harris, 7.252, 182.21; 18. David Hope, 7.271, 175.52; 19. Buddy Robinson, 7.350, 179.25; 20. Joe DeSantis, broke.